Quick charge your mobile device on the go with the Logo Branded Turbo Tube! New to our range of promotional powerbanks is this stylish yet simple aluminium power bank. 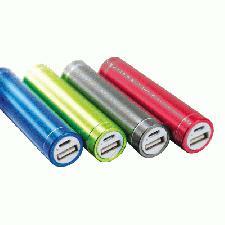 With a capacity of 2600 mAh and a maximum output of 5V/1A, this branded item is a sure hit with your customers. Pad printed with your corporate logo and details, the Logo Branded Turbo Tube is available in blue, green, grey, red or lime, perfect for showing off your company. For more information or enquiries on our Logo Branded Turbo Tube, fill in the form and we will get straight back to you.